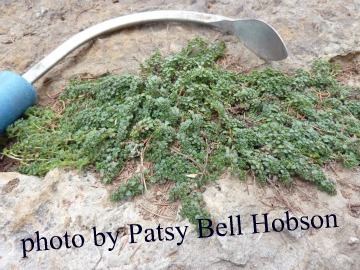 Minus Thyme is a perennial, hardy in zones 5-9. The evergreen, ground-hugging thyme is covered with pink flowers in late spring. One of the lowest growing thymes, it never exceeds 1”. Minus can take light foot traffic making it a good choice along pathyways and between stepping stones. I bought a plug pack of 12, two years ago from Richters Herbs. The plants did so well, I ordered another plug pack last spring. 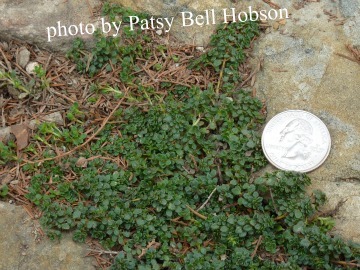 Then, I divided the tiny thyme that I had planted between stepping stones. It is growing enthusiastically between stepping stones and is easily divided. The spaces need weeding until the thyme fills in. This very slow process will take a couple more years to fill all the spaces between the stepping stones. I could speed the process by dividing the thyme clumps more often. Yes, there are lots of day lilies and cone flowers. Day Lilies are bright and cheerful and at their best in June. Everything in the garden is green and healthy. Later in the summer, plants get dusty and wilted or chewed and burned up by bugs and heat. There are lots of day lilies and cone flowers in full bloom. The roses haven’t been attacked by the Japanese beetles yet. Before I share my flowers, I wanted to show you this unobtrusive drip irrigation system for all 12 of the hanging baskets. Most of these plants are annuals and trial plants that are fun varieties new to me. 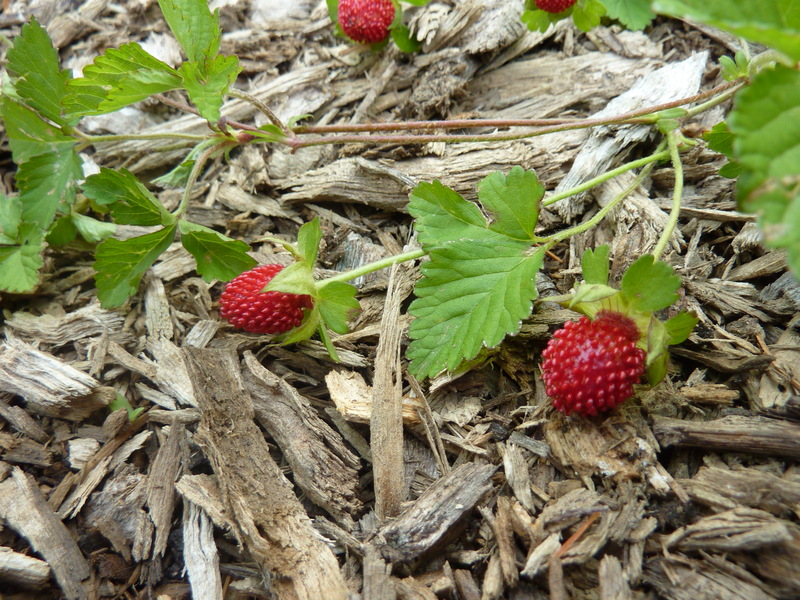 Spring raddishes hung on till the summer heat, then bolted, bloomed and are setting seed. 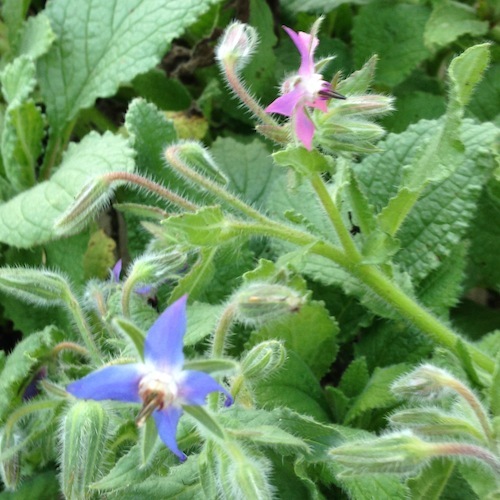 With all the beautiful flowers, sometimes it’s easy to overlook the little blooms in the herb and vegetable garden. I’m focusing on edible blooms and vegetable flowers this Bloom Day. Raddish seed pods look like little bean pods. 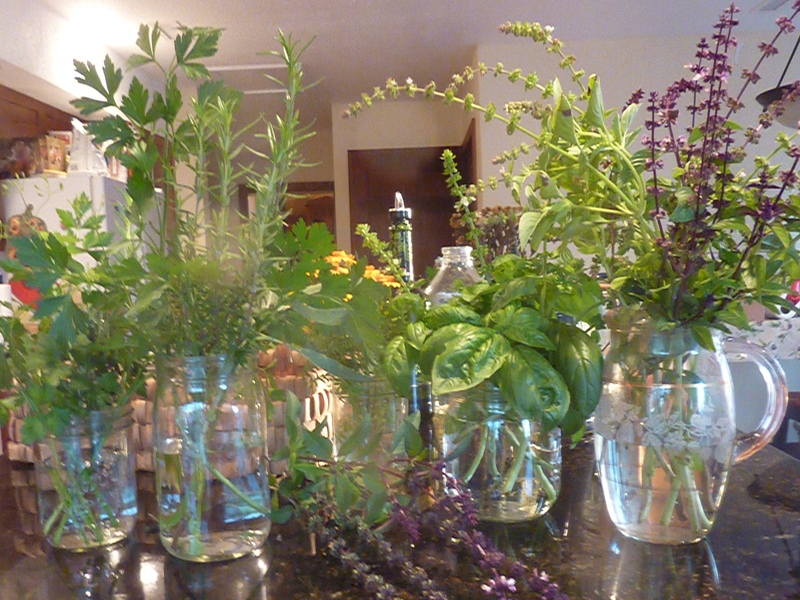 Herbs are at their best now and growing fast. Many, like this lilac colored geranium are edible. Add the petals to a garden salad or, garnish a dessert plate with these little flowers. I vowed to keep the zucchini in control this year. Harvesting squash blossoms, to stuff and fry is a tasty way to keep this beautiful vegetable from over populating the kitchen counter. Harvest these baby squash for grilling. enjoy fried squash blossoms or grill baby zukes. 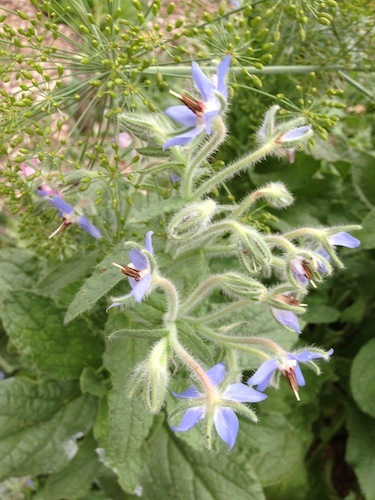 Nepeta, or catmint, is a member of the mint family. Catmint (Nepeta), is a member of the mint family. It is easy to grow, has few pests or problems and attracts loads of pollinators to the garden. 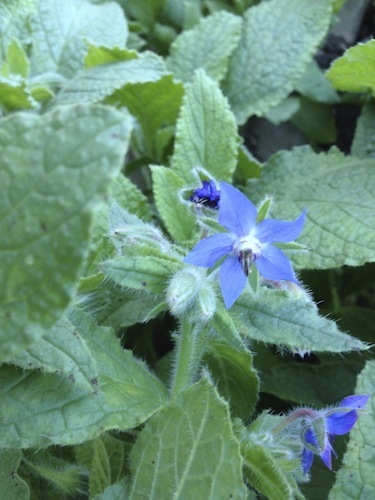 A few of these petit little blooms sprinkled on top of a dessert or a salad would be festive. Carbon tomato plant is loaded with yellow blooms. Growing fast, and delicate blooming while little fingerlings are growing in the ground. onion flowers add a very mild, touch of onion flavor. Onion flowers add just a hint of onion to poppy seed dressing, potato salad, rice wine vinegar or herb butter. This rose was just begging to be photographed before the Japanese beetles invade. And finally, these Jackson and Perkins roses just begged to be photographed before the Japanese beetles arrive. And, really it’s nice to end on a rosy note. I’m fanning through the seed catalogs, looking for seed that will eventually become my favorite dishes. Such as gazpacho, ratatouille or tabouli. I seldom use a recipe without tweaking it a little. This is The Cook’s Garden’s recipe for Vegetable Soup. I am sharing the recipe with you because I like the idea of harvesting all these beautiful vegetables from my garden. 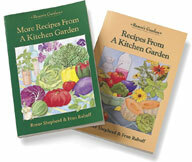 It is on their website along with many other tried and true recipes for your garden bounty. Add a can of chick peas or any vegetable you like and skip the ones you don’t. The idea, which you can see as you read the ingredients in the following link, is to grow your own soup vegetables and harvest, store or preserve your very own veggies. 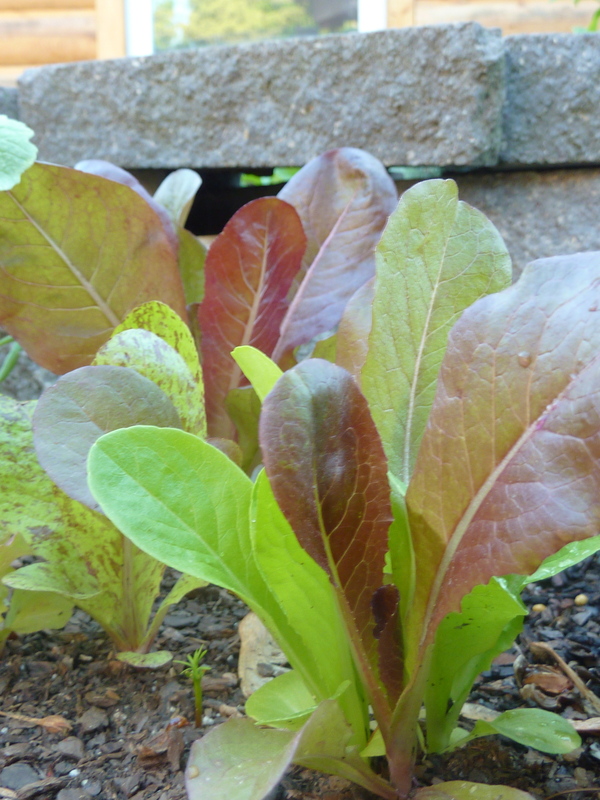 Your hard work will be rewarded by your delicious home garden medly. Directions: To prepare this soup, saute cut meat, minced garlic, onions and chopped celery in olive oil and add cup of stock as ingredients cook. Transfer ingredients to a large soup pot and add remaining ingredients. Cook under low heat for many hours. (You can fork test the vegetables for tenderness.) Soup can be thickened easily by using cornstarch or pre-sifted flour. When serving, remove bay leaves. Leftovers are a bonus. A quart of this soup in your freezer is a perfect too-tired-to-cook meal that is much more tempting than fast-food. Vegetable soup is a medley of your garden. Make some version of this as your signature soup. My Tweaks: Right before that last hour of cooking, take out enough soup to fill a container and freeze for later. Potatoes and carrots should not be completely cooked through; they will finish cooking when you reheat the soup. Season this portion of the vegetable soup with herbs when you reheat. Herbs are also best added during the last hour of cooking. Add a salt-free, all-purpose combination of bouquet garni. Bouquet garni, it is a traditional French herb combination of savory, rosemary, thyme, oregano dill, marjoram sage and tarragon. 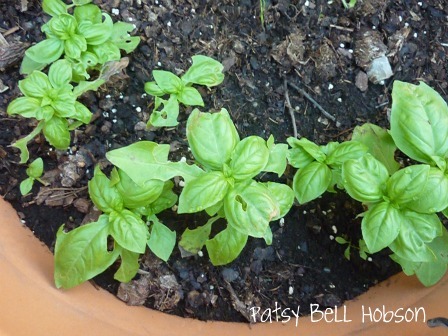 If you are unfamiliar with this herb combination, only add a teaspoon to your soup. With this big batch of vegetables, I would probably start with a tablespoon of bouquet garni, or a similar combination of these individual herbs. Also, you can skip the beef or chicken if you like. 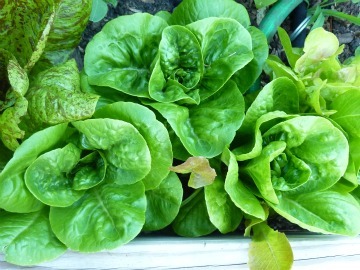 The Cook’s Garden has several great recipes on their website that will showcase your vegetable harvest at its very best. Broccoli romanesco is the color of broccoli and has the texture of cauliflower. At first, I was drawn to The Cook’s Garden catalog by their broccoli romanesco. This vegetable is an heirloom that has been around a long time but is new to me. I try something new in my garden every year, and this year I chose broccoli romanesco. I found broccoli romanesco seeds at The Cook’s Garden, Territorial Seed Company, Seed Savers and several other seed sources. Although broccoli and cauliflower have always been a challenge, I’m going to give it a try this spring.